October 31st marks the eve of All Saint’s Day, celebrated by dressing in costume and going door-to-door to collect candy and treats. This can be a fun family event and with a little planning and preparation can also include our furry, four-legged family members. While it can be fun to hand out candy and see the creative Halloween costumes, it’s important to keep your pets properly secure during the festivities. Continuous ringing of the doorbell and lots of oddly dressed strangers coming to the front door can be stressful on a pet and may even be a threat to the job of protecting their home. During trick-or-treat hours keep your pets secured in a crate or another room. As a distraction and a way to keep them occupied, you might want to play music, turn on the TV or give them a special bone or new toy. Checking on them frequently can help reduce anxiety and let them know you are close by. Plan ahead and have safe, healthy treats ready for your pets. The candy you’re giving out at the door and fun treats your children receive while trick-or-treating are not safe for your pets. Chocolate, especially the dark variety, is toxic to both cats and dogs. Artificial sweeteners used in many candies can also be problematic. Plan ahead, keep the candy bowls up on the table and out of the reach of your pets. Teach your children not to share their Halloween goodies with furry family members. Having special treats ready for your pets can make Halloween fun for the entire family. Think your dog or cat might have gotten into the Halloween candy? Call your local veterinarian immediately or refer to the ASPCA Animal Poison Control for guidance. Some pets love to dress up, others not so much. When selecting your pet’s Halloween costume keep their personality in mind. If your furry family member is an honorary member of the Screen Actors Guild, then by all means dress them up. If they’re more on the laid-back side, find them a fun bandana and call it good. When picking out a pet costume it’s important to watch for small, dangly or irritating decorations that could be tempting to chew on and possibly be a chocking hazard. Also be sure the costume fits well and doesn’t bind, rub, make it difficult for them to breath or prevent them from moving freely. Thinking of making your pet’s costume? Here are 27 DIY pet costumes courtesy of Buzz Feed. 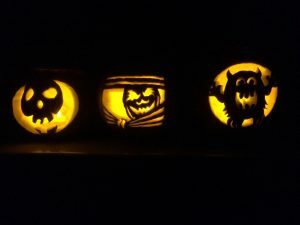 Carving pumpkins is part of the Halloween tradition. Adding a light and putting your creation out on display is both fun and festive, but think twice about using a real candle. In the excitement of the night, pets could knock over the pumpkin or let their curiosity get the best of them and get too close to the flame. Today there are many battery-powered options that can be used to safely illuminate your carved masterpiece. Happy Halloween from PetCure Oncology.